Dusit Thani Hotel Bangkok, at the junction of Rama IV and Silom Roads, overlooks the busy Saladaeng junction,Lumphini Park and beyond, its lighted obelisk at the pinnacle glowing like a magic wand in the night. There's a celestial allure to the name Dusit Thani. In astrology, the Sun, Moon and the five planets visible to the naked eye, Mercury, Venus, Mars, Jupiter and Saturn are referred to as heavenly bodies. "Dusit" in Thai is the fourth heaven and "thani" a city. 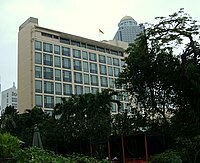 The concept of Dusit Thani, the city in the fourth heaven, was propounded by King Rama VI in 1918 as an ideal state of human well being, a model city of freedom and happiness. The history of the hotel dates back to 1949 when Thanpuying Chainut Piyaoui started the first hotel in Charoen Krung Road called the Princess Hotel with a loan from her parents. From this humble origin, she set her sights to develop the five-star Dusit Thani Hotel in Rama IV Road in the 1960s. Her vision was realized with the grand opening of the hotel in 1970. Back then, it was the only skyscraper in the neighborhood. This move was to lay the foundations for expansion of the list of Dusit hotels in the next four decades. The land got its name from the red-roofed pavilion (sala daeng) at the train station. The station was part of the Paknam Line, a Belgian-Danish joint venture, which operated Thailand's first railway from 1893 – 1959 linking Bangkok to the mouth of the Chao Phraya River (pak nam) where the ships were anchored. When King Rama V died in 1910, his son King Rama VI set up Chulalongkorn University, the oldest and leading university in Thailand, in memory of his father. Part of Saladaeng was allocated for the campus. In 1925, King Rama VI made a further donation of Saladaeng to be a public park. This park is the vast Lumphini Park, named after the birth place of Buddha, Lumbini in Nepal. The King Rama VI Monument stands at the gate to Lumphini Park just across the road from the Dusit Thani Hotel. The land on which the Dusit Thani Hotel stands was once the site of a nobleman's mansion. In 1987 the Dusit group expanded beyond Bangkok to other parts of Thailand by establishing Dusit hotels in Chiang Mai (1991) Chiang Rai (1991), Hua Hin (1989), Pattaya (1987) and Phuket (1987). 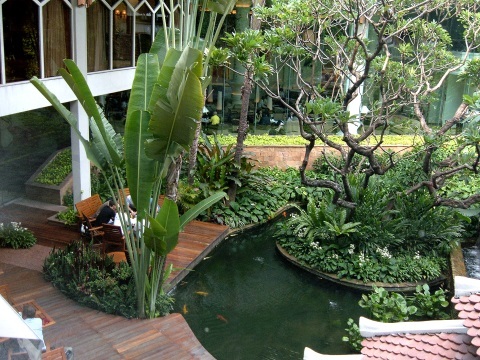 The group has also ventured into boutique hotels with the D2hotel in Chiang Mai. The other Princess hotels in the list are in Chiang Mai, Khon Kaen, Korat, Ranong and Koh Chang. Frequent visitors familiar with Bangkok will remember the Pathumwan Princess Hotel in Mah Boon Krong Centre and the Grand China Hotel in Chinatown. 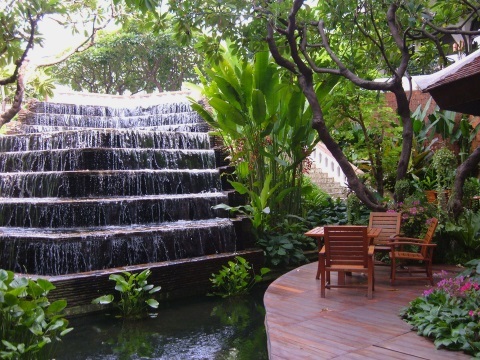 To enjoy an experience at the Dusit Thani Bangkok, click on this link or on any of the photos. For her contributions to tourism, Chainut Piyaoui was awarded the aristocratic title Thanpuying, the highest royal decoration awarded to women. Officially called Knight Grand Commander (Second class, higher grade) of the Most Illustrious Order of Chula Chom Klao, this title was bestowed upon her by His Majesty the King Rama IX on the 53rd anniversary of Coronation Day on 5 May 2000. Over five decades with Thanpuying Chainut Piyaoui as Chairperson and Managing Director, the Princess has grown into the flagship Dusit Thani Hotel Bangkok which in turned has sprouted 20 hotels in Thailand and the region - a feat in individual enterprise. In March 2007, the Dusit Thani Group announced a hotel management deal with Bird Hospitality Services to manage six hotels to be constructed by the latter in India. Dusit Thani is also considering investing in the construction and management of hotels in the sub-continent. The first three hotels in Delhi, Goa and Rishikesh are projected to open within the next few years. The next three in Amritsar, Jaipur and Pune are due by 2013. The Delhi, Goa and Rishikesh hotels will have a total of 500 deluxe rooms and suites. Each hotel will be equipped with meeting and conference rooms with the latest facilities and a deluxe spa. These new developments in India are poised for the Commonwealth Games in Delhi in 2010. Le Cordon Bleu, the renowned culinary institution synonymous with excellent cuisine, opened at the Dusit Thani Hotel Bangkok on 17 August 2007. The opening ceremony was graced by HRH Crown Prince Maha Chakri Sirindhorn. This will add to the eight existing restaurants serving Cantonese, French, Italian, Japanese, Thai, Vietnamese, US and international cuisine. Anna Kournikova, Black Eyed Peas, Cliff Richard, Gwyneth Paltrow, Julio and Enrique Iglesias, Margaret Thatcher, Pet Shop Boys, Ronald Regan, Sergio Mendes, Tom Jones and 50 cent. 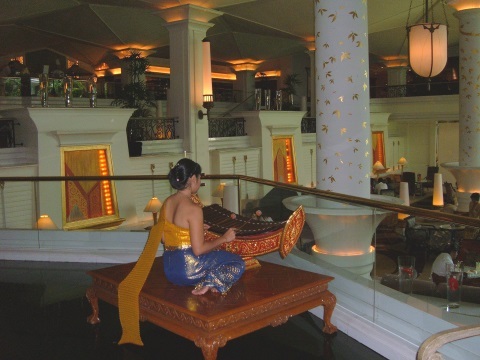 The Dusit Thani Hotel Bangkok turned 36 in 2006 with a grand exhibition on the history of the hotel at the lobby. She's in her forties now. Despite new skyscrapers all around, the city in the fourth heaven remains the dominant landmark in the Saladaeng junction. Down below the subway rumbles into the Silom station just by the side entrance to the hotel. High above Silom Road, the skytrain glides into the station aptly named Saladaeng. The legacy of the red-roofed pavilion lives on. For other Bangkok hotels and for the rest of the Hotels in Silom.